"Mother Goddess, South Bihar, Eastern India. 2nd/1st century BC. Beige Sandstone. 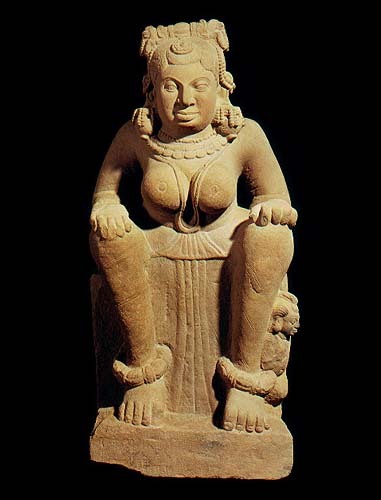 Height: 87cm"
"A sandstone image of a goddess, seated in Pralambapada, or the "European" pose, a small figure crouching at her side. At first sight this powerful and early figure of a goddess may seem enigmatic. Analysis is helped, however, by the knowledge the in India religious beliefs and the interpretation of ideas are part of a long, continuous, conservative tradition stretching back for thousands of years. Religious ideas and practices were formulated and recorded, verbally and then textually, long before the first religious images were made; they in turn effectively embodied already clearly understood notions of the nature of the gods. This goddess can be identified as one of a group of figures found in a small locality around Nongarh, South Bihar; what is now a rural, provincial area was, at the time this statue was made, close to the Mauryan empire's seat of power, Pataliputra (modern Patna), a city which drew visitors from the entire known world and which was, naturally, a centre of culture. Effectively Pataliputra can be considered the cradle of Indian sculpture for it was here that the first stone carvings were made as far as we can ascertain. Nongarh was first recorded archaeologically by the great pioneer in the field in India, Alexander Cunningham, who spent half his life travelling around the sub-continent investigating sites of historic interest. He did not see the statues we now know from the area - they were excavated later - but he does record the remains of what appeared to him to be a stupa and monastery complex from around the first century B. C. Brick remains which were still in evidence when Cunningham was there, in the 1870's, have long since been removed as useful building materials. Pal (1986) records that in the 4th-1st century B. C. period, timber and brick were the principal architectural materials, wood and terracotta being the principal media for sculpture. Stone appears to have been used first in the reign of Ashoka, and in the first place sculpture appears to have had an architectural context, e. g. as column capitals. Looking at neighbouring Bengal, McCutcheon (ed. Michell, 1983) notes that the brick architecture of temples in the pre-Muslim period incorporated stone elements, such as around doorways. He also points out that from frieze sculptures such as Bharhut and Sanchi, it appears that popular deities were worshipped in huts; it is only when the cults became incorporated in orthodox beliefs and Brahmans became involved in the rituals that images were housed in brick temples. As far as Bihar is concerned, Brown (1942) records that at Rajgriha, once the capital of Maghada, remains of bamboo framed buildings from around 800 B. C. developed some four centuries later to buildings of unbaked brick; although the materials changed, the simple building forms persist. During this period, social changes led to the building of fortified towns as well as centres of worship, including pilgrimage sites. Looking at the area of Nongarh today, a village some fifteen miles south of the principal channel of the River Ganges, in a region where it is swelled by numerous tributaries joining it from north and south, it is difficult to assess the religious significance it enjoyed in the past. It lies to the south of the great Buddhist teaching monasteries of Nalanda, Bodhgaya and Kurkihar. Although the Mauryan emperor Ashoka and his successors embraced Buddhism and encouraged the establishment of teaching monasteries, they never enforced their beliefs on their subjects; as the library sources indicate, a variety of gods and yakshas continued to be honoured. The earliest record of religious ritual is the Atharvaveda, dating from around 1000 BC (Pal 1986), then Panini, who wrote in the 4th century BC, records the names of numerous gods and goddesses (Meister et al, 1988). Patanjali, some two centuries later, updated Panini's work, adding a commentary, the Mahabhasya, in which the same gods are mentioned as popular (Meister, ibid); he names, amongst others, Laksmi, Sarasvati, Yami and Gauri. He also refers to yakshas, spirits of nature associated with earth and water, guarding the treasures of the natural world, and he describes rituals involving music and dance and more simple sites of worship. Evidence of these appears in images on the Sanchi railings, where trees, surrounded by railings are demarcated as holy. Likewise, a variety of small shrine forms appear. Moving on to the 3rd century AD, the Arthasastras (Meister, ibid) again mention some of the same gods and goddesses; particular mention is made of goddess cults, including a great mother goddess, and the first confirmation of statues placed in niches inside temples where they are worshipped. There is every suggestion that the Arthasastra is a record of established traditions. This is a good moment to concentrate on the form of the statue under consideration. She is sculpted in the round; her back, whilst not as three-dimensional as her front, is sculpted, her hair falling naturally down her back, tied into a loose knot below her shoulder blades. This suggests the statue was placed in a niche; the back was not meant to be seen, but, as the subject is a goddess and living, she has to be depicted completely, as in life. The plain, unembellished form of her seat provides a solid, secure base for the statue, if it was resting inside a niche, rather than attached to the architecture of a building. There is a point in the later Mauryan period, when stone sculpture metaphorically crosses a divide. Starting off as an architectural element, the image of the god emerges in relief, for instance on the railings of the Bharhut stupa, generally regarded as circa 100 B. C. Then, some fifty years later, the gorgeous apsaras at Sanchi are sculpted in the round; the image has broken away from the architectural form it was part of. It has passed over to join the ranks of terracotta images, in fact. The great majority of surviving images of gods from the Mauryan period are in terracotta, generally considered to be votive images made at pilgrimage sites along the Ganges; if this is the case it is not unreasonable to conclude that statues of the gods in question, probably in wood, existed at these places as focuses of worship. Pal (1986), however, suggests that these familiar images may have been buried in the fields to promote fertility, thus they had a ritual rather than votive function. He points out how the female figure in terracotta is somewhat abstracted in form until the 2nd-1st century B. C. when it becomes sophisticated, great emphasis placed on the head with elaborate head-dress and massive ear ornaments; the back is usually plain. However, in the same period a few seated figures were made; Pal suggests that these were used for worship rather than votive or ritual function. One, in the Los Angeles County Museum of Art collection, which he illustrates, has the hands placed in the same way on her knees as this stone image does, the right hand palm uppermost, in varadamudra, the granting of boons, the left grasping the knee. Concentrating on the stone image under review, it has already been established that there are few stone statues but more terracotta images and stone relief figures from the late Mauryan period with which she can be compared; this is complicated somewhat by the disagreement of scholars in their dating of certain images, notably the Didarganj chowri bearer, variously attributed to the 3rd century B. C. -1st century A. D. Furthermore, whilst the terracottas are unquestionably goddesses, the stone images tend to be of subordinate females, of the human world or attendant on gods, the Didarganj lady, for all her stately bearing, being one. The apsaras at Sanchi, for all their impact, are largely decorative. The seductive, semi-naked ladies who form the upright elements of railings in the slightly later 1st-2nd century A. D. are, quite literally, in a supporting role, with an aesthetic, rather than spiritual role. A notable exception to all this, however, is a small roundel from the Bharhut railing, depicting the goddess Lakshmi. Although standing, her physical form and her dress, a long skirt, are similar to this goddess; she emits the same aura of physical, and through that, spiritual power. There is a distinct trend in body form, both male and female, in the images of the 3rd century B. C. -1st century A. D. The effect is powerful, with broad, shelf-like shoulders, short necks, decoration largely concentrated on the head and upper torso, in the case of female images giving large breasts and stomachs. The massiveness, in their case, continues sometimes to enormous anklets which appear to weigh them down to the ground. In this image, the sculptor has gone to considerable lengths to explain the image in ways a relief sculptor cannot. The realism of the pose is the first thing one notices; Pralambapada, or the "European" pose is seen in other statues of the Mauryan period (for instance mentioned by Harle, 1986:200) and in the slightly later 1st century A. D. (Bachhofer, 1939, 1973, Plate 77). In this statue the artist has sculpted a certain naturalism into the slightly hunched shoulders, the muscles running down the upper torso to the breasts, the tense fingers of the left hand, and the curled toes. The anklets, often appearing impossibly heavy to wear too, have been explained clearly; they are swathes of cloth held at intervals by loops. The whole attitude, slightly forward leaning, suggests a goddess who does not just accept the adoration of the faithful, but who is really listening to their supplications. The whole expression reinforces the impression that this is a goddess who is powerful in her own right. The goddess's face is very similar to those of the other statues found at Nongarh. Whilst this site has yielded female, but no male figures, one of the group also bears similarities to the renowned figure of a dwarf, provenance unknown, in the National Museum, New Delhi (Chandra, 1985). This goddess has an implacable expression with strong nose and mouth and slightly projecting lower lip. She has almond shaped eyes and elegantly arched eyebrows giving her an individual expression. Her hair falls naturally, framing her face, in a style similar to other statues of the period, the very casual fastening at the back is seen on some of the Sanchi apsaras as well as small images on the Amaravati friezes. Above her brow is a jewelled disc, of a type seen on Mauryan images, which continues, but becomes plainer, in the early centuries A. D.
Her head-dress is very much in the style of Mauryan Bihar. The terracotta images of Bengal tend to show an elaborately wrapped turban which has jewelled pins stuck into it. However, terracotta images from Bihar (Kala, 1993) show just the same general shape as is seen here. This is formed from loops of pearls (seen also in a statue from Devangarh, Gaya district; Asher, 1980) which are held in place by an unusual horizontal ornament. On either side a makara appears to be swallowing a lion (or maybe he is disgorging it) from whose mouth falls strings of jewels. This maybe gives a clue to the identity of the goddess. If the makara is indeed swallowing the lion, it would indicate the power of water over land is symbolised, making her a river goddess. If, however, the lion is being disgorged, and he is himself bringing forth jewels, it suggests the possibility of material wealth and power emanating from the goddess. Lions are an important feature of Mauryan sculpture, the most famous example being the lion column finials, so it is unlikely that he is being overpowered by the makara. Whatever the symbolism of the jewel, however, its position at the top of her head, i. e. the pinnacle of the goddess's power, would appear to confirm that it should be "read" and understood in order to recognise the nature of the deity. From the temporal point of view it serves to illustrate the enormous skills of the craftsmen of the period; examples of gold jewellery and finely carved ivories have survived to prove this. She also wears an extraordinary part of earrings, the dimensions of which would appear to make them too heavy even for an ear used to large ornaments. They comprise a claw of pearls, maybe reiterating the symbolism of the power of the lion, clutching an orb or vase, again, maybe, presenting the symbolism of the head-dress combining earth and water. No exactly similar pair of earrings have been noted but the statues of the period show a vast variety of styles, many of them unique. The goddess wears a long skirt, as does the Bharhut Lakshmi, and the Didarganj chowri bearer. Nakedness in female images appears to be a 1st century B. C. innovation but it was never universal and appears to have been reserved for images of younger women. At her side crouches a small male figure. This may identify the principal image as a mother goddess, although she hardly seems aware of his presence, or it may be the image of a donor, or attendant, such as is frequently seen on terracotta images. The notion of a personified purusha, embodying the power of the god, appears to be a much later innovation, from around the 5th century A. D. and, in any case, the pose of this figure does not in any way embody power. Whilst it is not possible to firmly identify the goddess it has to be concluded that the general impression she gives is one of wealth and well-being, such as emanates from the contemporary terracotta images of Lakshmi. Worship of Lakshmi, although it later became associated with Vishnu was, at this period, independent; the goddess was probably known by a variety of names in different localities but essentially she was a bringer of wealth and fertility. Irwin (in Guy, ed. 1995) points out that the different cults in India often share a universal cosmological viewpoint, a view which is echoed by Blurton (1992) who states that the land and rivers of India, on whose fertility the largely agricultural human population depend for their own well-being, are regarded as gods themselves, as well as being associated with localised gods. The changing seasons continually re-enact the act of creation and destruction, the population is dependent on the benevolence of the gods. Whilst localised cults were becoming adapted to fit in with orthodox Brahmanism in the later Mauryan period, worship of yakshas and yakshis associated with particular places persisted and surviving statues from various parts of northern India are evidence of the wealth and sophistication of their cult devotees. A late Mauryan dating, 2nd century-1st century B. C. appears reasonable for this image but, as already stated, the difference of opinion amongst scholars in their dating of well-known images does not allow one to be confidently specific. Nevertheless, the formality of this figure is more in keeping with the images at Bharhut, circa 10 B. C. than with the slightly later Sanchi, circa 50 B. C.
What is abundantly clear, however, is the extraordinary power of the goddess depicted. It is difficult to think of other images of goddesses from any period who project such strength of personality whilst seated in repose." RAO, Manjushree: Sanchi Sculptures, and aesthetic and cultural study, New Delhi, 1994 .